GAIN - Increases the number of harmonic components in the input signal. More than 4-time higher amplification as compared with the conventional overdrive effects combined with the 2-level signal compensation system used separately for the 4 possible Drive adjustments allows to utilise it more effectively. 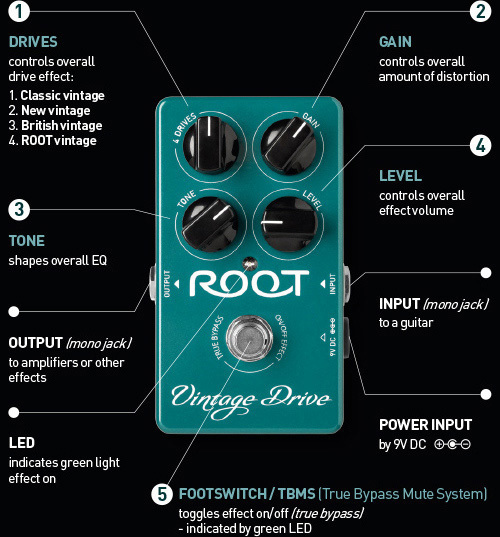 Due to the fact, we can have both the classic vintage drive sound as well as the modern and juicy one which is, however, not devoid of the characteristic features of the classic one. TONE - An unconventional regulation system allows to control the timbre smoothly within the whole sound range. The resulting correction filter in each regulator/control position makes the sound round and warm. It pushes forward an instrument, emphasises its character but at the same time keeps in check high tones, so that they would not become annoying. LEVEL - Output volume is controlled in the 3 points of the system. The designed compensation circuits effectively equalize the natural differences in the signal levels that develop in the drive generating tracks. Due to the introduction of such a solution, it was possible to obtain very similar output signal levels in all the 4 DRIVE programs independent of the adjustment of the GAIN control. TBMS (True Bypass Mute System) - is a specifically designed system minimising transient states (tappings) while using the foot switch and eliminating the possible development of the minimum overdrive system inductions and its penetration of the True Bypass track when it is exposed to the influence of the strong electromagnetic field.